We need volunteers to help raise money for the Red Cross by collecting money in the school and hopefully in Myyrmäki shopping centre (Red Cross is currently in discussion to gain permission). Everyone is welcome to volunteer and assist. Search for Metropolia Charity in Facebook (or click our Facebook badge below) and press like. Comment there that you would like to volunteer or send an e-mail to info(at)metropoliabusinessschool.fi with the title Metropolia Charity Volunteer. We are raising money as part of operation Hunger days. We hope to have some small event or something to sell besides collecting money. 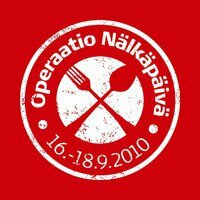 What is Operation Hunger Days (Nälkäpäivä), 16-18 September 2010? If you cannot volunteer then please tell others and donate a little money. Next Post What is your Top Digital Tool to aid learning?